Enjoy a self-guided stroll through the historic town of Fall City. You’ll see a variety of early homes, halls, and businesses, some existing now only in photos and memory. Click on the links to see early photos and further reading. You can also download and print the Historic Signs Walking Tour Map developed by the Fall City Historical Society. Itinerary designed with generous support from 4Culture King County Lodging Tax. Start your day at the The Roadhouse Restaurant and Inn (4200 Preston-Fall City Rd SE). If you choose to park at this location, please save the spots close to the entry for customers. Take time to have coffee or plan to come back to eat after your tour! The original single-story Riverside Tavern at this site was built by Paul Holden in 1925. Riverside Campgrounds and a dance pavilion were close by. Owner Mae Brown in 1933 added a second story with guest rooms and changed the name to Riverside Tavern and Lodge. In 1966, Ed DeGrace acquired the building, did some remodeling and changed the name to the Colonial Inn, a restaurant enjoyed by the community for over twenty years. In 2005, building and business were sold to Scott Krahling of Sammamish and Charlie Kellogg of Fall City. After extensive refurbishing, they opened in 2008 as the Fall City Roadhouse. Since 2016, the restaurant and inn have been operated by Rob Rosemont. From the Roadhouse, go south (left) on Preston-Fall City Road to the crosswalk to safely cross that busy street. Then go right up to the main road along the river and left to the corner of 338th Pl SE, where you will see the Model Garage (1920), Fall City’s longest operating business. In 1920 Lud Peterson leased an earlier garage on this site and opened the first Model Garage. Around 1926, he purchased the garage building and the large Murphy house on the corner, took down the house, and hired Bill Blaisdell to build a larger 40 x 60 feet cinder block garage on the corner lot. When the Redmond-Fall City Road was widened around 1929, the new Model Garage was moved south 50 feet to its current location. It was one of the few River Street buildings to survive the roadwork. Read more about the Model Garage here. Across 338th Pl SE from the Model Garage is the Riverside Tavern. On this corner lot from 1890 through 1958 were large halls built by the Fall City Lodge No. 59 of the Independent Order of Odd Fellows IOOF Halls (1890-1958). The first IOOF Hall (1890-1929) had a second story meeting room and a large rental space at street level. Dunstan Brothers General Merchandise occupied the ground level space from 1904-1929. When Redmond-Fall City Road was widened in 1929, this hall was torn down and a second hall (1929-1958) was built toward the back of the lot. In 1958 the second hall was torn down and the current building replaced it. The Riverside Tavern business moved from its original location (now the Fall City Roadhouse) to this site around 1960. Continue west on Redmond-Fall City Road to El Caporal Restaurant, at the corner of 337th Pl SE. On this corner lot in 1886, David ‘Doc’ Taylor built a store, with a restaurant on the east side and a two-story house for his family on the west. When these buildings burned, he built a two-story Taylor Hotel Hotel Corner (since 1886) on the lot, which he sold in 1903 to Ronnei and Nelson. They changed the name to Hotel Fall City and added a saloon. The new owners died in the flu epidemic of 1919. 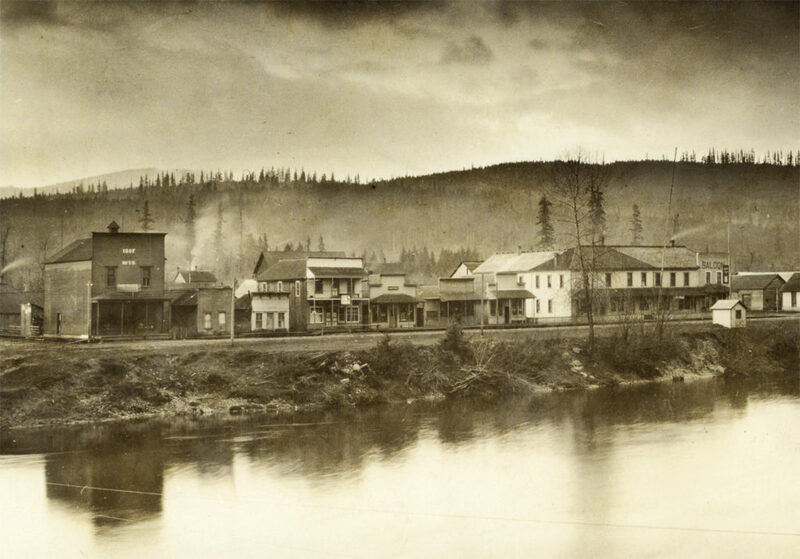 Lars Johansen bought the building and changed the name to Fall City Hotel; however, it burned to the ground in 1925. Lars built a new Fall City Hotel on the site, which he moved to the back of the lot in 1929 when the road was widened. This building has continuously been in use since then and today houses El Caporal Restaurant. Read more about the Hotel Corner here. Cross 337th Pl SE and turn south on that street. Just past the alley is a cinderblock building used since 1961 by the Fall City IOOF. In 1947, the Fall City Fire Department built this small building as the first Fall City Fire Hall Fall City’s First Fire Hall (1947-1961). It housed the Fire Truck and volunteer firemen, as well as providing space for various pieces of equipment and for firemen to relax when on shift. Turn right (south) on 337th Pl SE to SE 43rd St. Diagonally across the intersection is the Masonic Hall. As the tallest and least altered of Fall City’s buildings from the late 19th century, the Falls City Fall City Masonic Hall has been a visual community landmark for well over 100 years. The Falls City Masonic Lodge No. 66 was chartered in 1890 and met initially in the hall above Taylor’s Store on River Street. In 1894 the store burned, destroying all the property and records of the Lodge. The members moved quickly to plan and construct the current hall and held their first meeting there in January 1896. Read more about the Masonic Hall here. Across 337th Pl SE and slightly south is the Neighbor-Bennett House. Among the older houses remaining in Fall City, the Neighbor-Bennett House, built in 1904, is considered the most elegant for the quality of its detailing. It was built by Emerson Neighbor, who with his brother owned a general store on River Street and helped establish the town’s telephone service. Emerson sold the house in 1912 to Frank Bennett, who operated a delivery and distribution system for large quantities of milk produced in the area. In the beginning this was by horse and wagon along a rough trail, with the 18-mile round trip requiring a relief team of horses. Read more about the Neighbor-Bennett House here. Cross 337th Pl SE again, and go to the corner of 43rd Pl SE, where you will see the Fall City United Methodist Church and its parsonage. On this corner in earlier days was the large Valley Hotel (1890s-1909), which was built in the late 1890s. It burned in July of 1909 and was not rebuilt. The original part of the present United Methodist Church church building was built in 1899 as the Fall City Baptist Church and sat across 337th Pl SE on the large lot belonging to the Neighbor-Bennett House. The Methodists gladly shared the building, having lost their earlier church. In 1919 the building was bought by the local Methodists. About 1927 the Methodists bought the property across 337th SE and in 1929 the church was moved to its current location and turned to keep the entrance on Main Street (337th Pl SE). In the late 1950s and 1960s additions and remodeling brought the building to its present configuration. Read more about the United Methodist Church here. From the church, turn left (east) on SE 43rd St and go one block. The Moore-Parmelee House (1905) is diagonally across the intersection with 338th Pl SE. Charles and Minnie Moore moved to Preston in 1903 with their five children. In 1905 they bought a lot in Fall City for $40 and built a house with lumber from the Preston Mill, using inexpensive vertical-plank construction. They sold the house around 1920. Eugene Parmelee and Elizabeth Alexander met in Fall City in the early 1900s and married in 1912. Gene died in 1937, leaving Elizabeth to raise their seven children. In 1943 she arranged to buy the Moore house for $1000 and the house has been in the family since that time. It has been painstakingly restored. Read more about the Moore-Parmelee House here. Proceed west on SE 43rd St, past the church, to the corner of 336th Pl SE. Turn left (south) on 336th and watch for a large historic sign on the right. The historic sign at this location has photos and background on all the Early Schools block (1873-1915) from 1873 to 1916, when classes moved to the newly constructed Brick School. The White School (1890-1900) and the Brown School (1900-1915) were both located on the large “school block” bounded by 335th and 336th Pl SE and SE 43rd and 44th Streets. Read more about the Early Schools here. Proceed north (toward river) on 336 Pl SE to Redmond-Fall City Road. Turn right and watch for the Fall City Family Dental Clinic. The David ‘Doc’ Taylor House (1903) is the oldest building on “River Street.” David ‘Doc’ Taylor, his wife Helen, and their three children were the first family among the settlers in the Fall City area in 1872. When Doc sold the Taylor Hotel in 1903, he built this house for his family. It is also one of the three buildings that survived the road widening in 1929. It has been operated as the Fall City Family Dental Clinic by Sabra and Greg Fawcett since around 1980. Go west again on Redmond-Fall City Road SE and cross 336th Pl SE. On the west corner of that intersection is the Farmhouse Market. This southwest corner had seen a series of grocery stores Fall City “Grocery Corner” that have served Fall City since 1922, when Chapman’s Cash Store (interior shown c1925) opened. The original grocery building was located in the present parking lot area. It burned in 1972 and the current building was constructed by Don Bluher. He leased the building to Gene and Carol Stevens, who operated the longest continuous business here, Stevens’ Family Market, from 1972 to 2006. In late 2006 Jay Bluher stepped in to remodel and opened as the Farmhouse Market in January 2007. Read more about the Grocery Corner here. Go west again on Redmond-Fall City Road SE past the Farmhouse Market and watch for the “double” building with brick facing on the front at 33511. This small building Macrae Building (1908) has a rich history. The west half of the site originally was the Burns & Son One Price Store (1909-1922). Robert Burns sold the store to his son-in-law Jesse Kelley, who replaced it with a concrete building and offered a variety of construction services from the J. E. Kelley Shop until 1944. Jesse and Artie Kelley then sold the building to Artie’s cousins, Howard and Clara Stow, who operated Stow Hardware here until 1954. New owner Jack McClymont added the east half to the building and operated McClymont Hardware until 1976. Other hardware operators continued until around 1992, when the building was sold to Ian Macrae. He has maintained the building and made it available for a variety of businesses. Read more about the Macrae Building here. Continue west past the Macrae building to the crosswalk and cross Redmond-Fall City Road to Quigley Park by the Snoqualmie River. Fall City’s location at a favorable landing spot on the Snoqualmie River was a major reason for the early settlement here. Until railroad transport became available, first dugout canoes and then steamboats were the main means to ship materials to and from the Snoqualmie Valley towns. The river saw lively steamboat travel until the late 1880s. The river offered transport, but was also an obstacle to travel. Often small ferries were used to cross before bridges were built. A classic early photo of Fall City shows the Rutherford brothers’ ferry, powered by the river current. The building of the first Snoqualmie River Bridges across the Snoqualmie River at Fall City was a big event. The wooden bridge, with a span of approximately 350 feet, opened in 1889. It fell in the spring of 1900 and was rebuilt the following year with salvaged materials. In 1917 it was replaced by the first concrete bridge, a graceful arched bridge. Due to the increased size of vehicles and volume of traffic, this second bridge was replaced in 1980 with the current bridge. Use the crosswalk to return to the south side of Redmond-Fall City Road. Cross 335th Pl SE to the corner where you will see the Prescott-Harshman House. The Prescott-Harshman House is a carefully restored turn-of-the-century house. In 1912, it became the home of Newton and Julia Harshman and the office of their business, the Fall City Telephone Company. The Phone Company was a vital link among the communities of Carnation, Preston, Fall City, North Bend, Newcastle, Coal Creek and Snoqualmie, connecting them with the “outside world.” On Julia’s death in 1933, her daughter Gertrude and husband George Satterlee, continued to operate the company until 1947. Read more about the Prescott-Harshman house here. Continue west past the Prescott-Harshman House. On the left you will see the Fall City Library, and across from it the Fall City Totem Garden (1934) and totem pole. Two Historic Signs were commissioned in 2006, when the Fall City Totem Garden was officially created. One tells the history of the original Fall City Totem Pole, its installation in 1935, dedicated to Julia Harshman, and its removal due to deterioration in 1964. A second totem pole replaced it from 1982 to 2001, when an amazing community effort accomplished the restoration of the original totem pole and its return to the park. A second sign tells the legend of the pole, as communicated by the original carver, Hugh Hinds of Fall City. The Totem Garden Park is an ongoing demonstration of community spirit in Fall City, faithfully maintained by local volunteers. Continue west past the Totem Garden and go toward the large brick Fall City Gymnasium. The Historic Sign is in front of the gym. The three-story Fall City Fall City Brick School (1916-1970) was located where the parking lot for Fall City Elementary School now sits. It was home for kindergarten through high school students from 1916 to 1944. Only a handful of graduates from the Brick School are still with us. The Fall City Gymnasium, built in 1931, has been well maintained and is still in use today. After Snoqualmie Valley high schools were consolidated to Mount Si High School, the Brick School continued to house elementary school students until the late 1960s. It was demolished in 1970. Read more about the Fall City Brick School here.